I have an exciting high school literature course to share with you today from Writing with Sharon Watson. We've been working on this with my tenth grader for the last few weeks and I'm happy to say things have been going great. 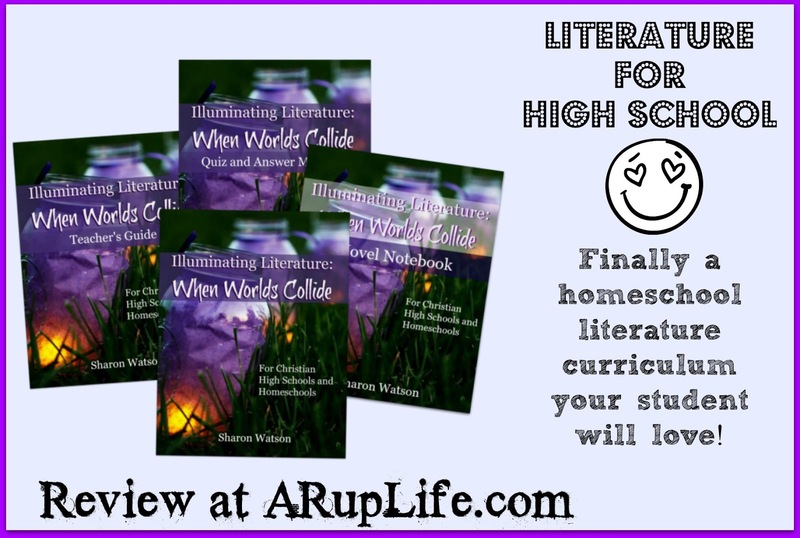 It is hard to find good literature courses for the upper grades so it is really exciting to have this new resource! The student book, teacher's guide, quiz and answer manual were all physical books that were soft bound. The Novel Notebook was a download that I put in a binder for my son to use - it is optional to download, your child could make their own (instructions included on how to do this in the course.) I knew my son wouldn't make his own notebook so the download was the best option for us. I have a very reluctant learner in my oldest son. He likes some courses (History and Greek) and will willingly do them but literature has always been a struggle. I really don't know why except that he just doesn't want to do a lot of the extras that go with it (projects, papers, workbook pages.) He will happily read any book I assign but the rest is typically like pulling teeth. I was excited to get to try a new literature program with him this year - looking for something that fits him and that he would enjoy. One of the first things I noticed upon looking over the material is how the author writes to the students. Her tone is very friendly and I knew that would appeal to my son. It almost felt like a reading group in our home. (On a side note this course can be done as a book club with other families/kids - we did not use that option but the course gives instructions on how to implement that.) The student book didn't have a lot of assignments for each book which I knew would also be a hit here. We worked on the first unit for the book Pudd'nhead Wilson. He actually enjoyed the story and would share about what he read as he went through the book. That is a big plus as well. I feel like Sharon Watson picked a good selection of books that actually appeal to kids! I'm looking forward to seeing his thoughts on The War of the Worlds - which is next up in our work. I liked that there were online aspects too! My son took a "Yes, I read it" Quiz , a literary term quiz and the opinion survey. This is a nice change up to have the online option (you can do this offline too - that is included with the Quiz and answer manual). At the end of the chapter their is a project to complete. I liked how many choices there were. There is truly something to appeal to many different areas of interest. My son chose to draw a picture as his option. Overall we were pleased with this course. All the usual suspects pertaining to literature are covered (plot, summary, foreshadowing, conflict.) It is definitely high school level but very appealing to reluctant workers. Don't just take my word for it! 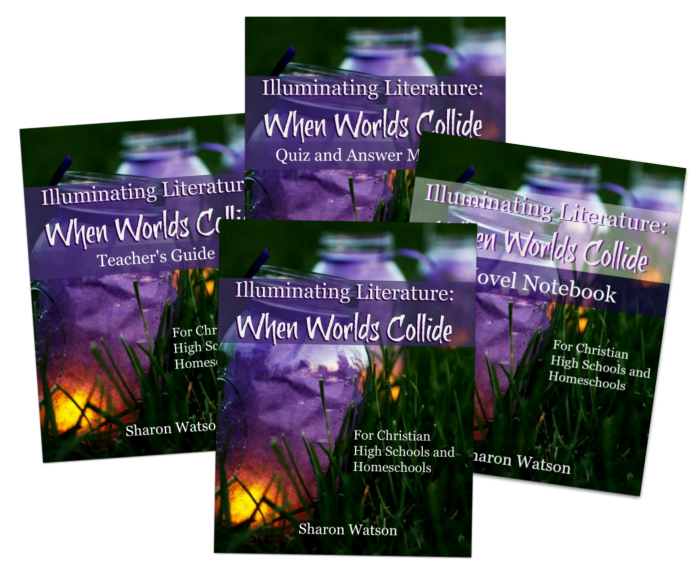 See what the other crew reviewers are saying about Illuminating Literature! Hi, Lisa! A big congratulations on your Baby Event! Thank you for your encouraging review of Illuminating Literature. I'd love to know what picture your son drew for the Pudd'nhead Wilson activity. Did he choose an event from the book or a character? Speaking of pictures, I love the image you made for the review. Thank you! He drew a picture of Roxy walking the babies in their carriage. He is 15 so not too keen on me posting his project but thank you for the interest! That's okay! I like that he chose something with some movement in it.